Draft: 2011, Toronto Blue Jays, CAth rd. Joseph Anthony Musgrove...Is a 2011 graduate of Grossmont High School in El Cajon, CA, where he pitched and played first base and was a teammate of Stephen Brault...Went 7-5 with a 2.40 ERA (78.2ip/27er) and 100 strikeouts in 14 games as a senior, while also batting .350 (36-for-103) with nine home runs and 32 RBI... Was also a part of the offensive and defensive line on the football team. Saw limited action in spring training due to shoulder discomfort...Threw 92 pitches in 6.0 innings of action against the GCL Pirates in Bradenton on 3/31...Was placed on the 10-day disabled list on 4/2 (retro to 3/30) due to a right shoulder muscle strain...Threw a 25-pitch bullpen session on 4/19 and a 35-pitch session on 4/22...Took part in a simulated game at PNC Park on 4/25; threw 37 pitches... Made a rehab appearance with Bradenton on 5/1 and gave up five hits and two runs in 3.0 innings (36 pitches)...Had rehab transferred to Double-A Altoona on 5/6 and made start there on 5/7 vs. Bowie (4.0ip/2h/1r/1er/0bb/4os); threw 28 of his 34 pitches for strikes...Pitched 5.2 innings of no-hit ball and struck out six batters while winning his first rehab start with Triple-A Indianapolis on 5/12, throwing 60 of his 79 pitches for strikes...Suffered a loss in his second start with Indy on 5/18 at Durham (5.0ip/10h/6r/6er/2bb/5so - 96 pitches)...Went 1-2 with a 4.58 ERA (17.2ip/9er) in his four rehab starts...Was recalled from rehab and reinstated from the D.L. on 5/25; made his first start with the Pirates that night vs. St. Louis and pitched 7.0 scoreless innings for the win (67 pitches)...Also singled off John Gant for his first Major League hit on 5/25...Gave up one run in 7.0ip and threw 100 pitches while winning his second start on 5/20 vs. Chicago (NL); also collected his second hit with a single off Kyle Hendricks...Went 0-3 with a 7.45 ERA (19.1ip/16er) in his next four starts thru 6/23...Started in front of close to 100 family members and friends in his hometown of San Diego on 6/29 and pitched 7.0 scoreless innings for the victory; also went 1-for-2 with a sac bunt at the plate...Went on the 10-day D.L. on 7/3 (retro to 6/30) with a right index finger infection... Was reinstated on 7/10 and started that night vs. Washington; struck out a career-high nine batters but lost a 5-1 decision (6.0ip/2er)...Collected first career extra-base hit (double) on 8/6 at Colorado off lefty Kyle Freeland...Served as a pinch-runner on 8/20 vs. Atlanta...Threw 21 straight strikes to begin the game on 8/30 at St. Louis; the most by any Major League pitcher since 1988 when pitches were first tracked...Struck out eight batters in his win on 9/4 vs. Cincinnati (6.1ip/2er)...Was shut down for the season after making his final start on 9/17... Was diagnosed with a stress reaction on the front of his pelvic bone and an abdominal wall muscle strain...Pitched at least 6.0 innings in 14 of his 19 starts and at least 7.0 innings eight times; went 5-2 with a 1.75 ERA in those eight games...Had surgery on 10/19 to repair the abdominal wall and to help the stress reaction heal (surgery performed by Dr. Craig Smith in Los Angeles, CA). Made his first career Opening Day roster as Houston's No. 4 starter in the rotation...Made his first 15 appearances as a starter and went 4-8 with a 6.12 ERA (78.0ip/55er) and .306 opponent batting average against...Made his final 23 appearances in relief and went 3-0 with a 1.44 ERA (31.1ip/5er) and a .196 opponent batting average against...His 1.44 ERA as a reliever ranked tied for third among A.L. relievers with at least 30.0ip...Was scored upon in just four of his 23 relief outings...Tossed 7.0 scoreless innings and threw a season-high 102 pitches in a 2-0 victory vs. Baltimore on 5/26...Was on the disabled list with right shoulder discomfort between 5/27 and 6/12...Struck out a season-high seven batters on 6/18 at Boston... Was optioned to Fresno on 6/23 and made lone Triple-A start on 6/29 vs. Albuquerque...Was recalled on 7/5 and made two starts before moving to the bullpen...Was scoreless in a careerbest 12.1 consecutive innings over nine games between 8/2-25... Recorded first two career saves in back-to-back appearances on 9/16 vs. Seattle and 9/20 vs. Chicago (AL)...Made seven total appearances during the post season...Was the winning pitcher in Game Five of the World Series against the Dodgers; pitched a scoreless 10th inning in Houston's 13-12 victory...Went hitless in five at bats as a batter during the regular season. Made his Major League debut in August, pitching in 11 total games in the Majors while making 10 starts down the stretch run...struck out 55 batters in his 62.0 innings, while walking 16 for a 2.32 walks per 9.0 innings ratio...threw five quality starts, while three of his last four starts were quality starts...posted a 3-1 record with a 1.75 ER (7ER/36IP) and 37 strikeouts in six games (five starts) at home...compiled 147.1 innings pitched between the Majors (56.2) and minor leagues (85.1), by far a career high...increased his innings total in five consecutive seasons: 2012 (17IP), 2013 (32.2IP), 2014 (77IP), 2015 (100.2IP)...began the season at Double A Corpus Christi before getting a promotion to Triple A Fresno on May 13...was recalled from Triple A on Aug. 1 for his first career stint in the Major Leagues...made his Major League debut on Aug. 2 vs. TOR against his former organization... tossed 4.1 scoreless innings of relief, allowing just one hit and one walk while striking out eight in a 2-1 Houston loss...set a Major League record for strikeouts by a reliever in a Major League debut...also set a franchise record for most scoreless relief innings in a Major League debut, which was previously held by RHP Jose Cisnero (3.2IP in 2013)...made his first career Major League start on Aug. 7 vs. TEX, tossing 7.0 innings of one-run ball while striking out six with no walks...became the third pitcher since 1913 to record at least six strikeouts with no more than one walk in each of his first three appearances in the Majors...the only other two to do it were RHP Johnny Cueto (2008) and RHP Masahiro Tanaka (2014)...his 21 strikeouts over his first three games in the Majors marked the third-most in club history behind RHP J.R. Richard (29 in 1971) and RHP Tom Griffin (26 in 1969)...on Sept. 21 at OAK, carried a no-hitter into the 6th inning, ultimately allowing one run in 5.1 innings in a 2-1 Astros win...went 7-4 with a 2.74 ERA (26ER/85.1IP), 87 strikeouts and 10 walks in 16 games (14 starts) between Triple A and Double A...was the starting pitcher for the U.S. 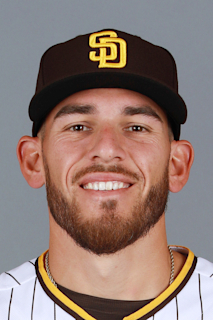 Team in the SiriusXM All-Star Futures Game and tossed a perfect 1st inning in front of his hometown crowd at Petco Park in San Diego, Calif...went 2-1 with a 0.68 ERA (1ER/26.1IP), three walks and 30 strikeouts in six games (four starts) at Double A Corpus Christi to begin the season...was the Hooks April Pitcher of the Month...was leading the Texas League in ERA prior to his promotion to Triple A...went 5-3 with a 3.81 ERA (25ER/85.1IP) in 10 starts at Triple A. Was named the Astros Minor League Pitcher of the Year after going 12-1 with a 1.88 ERA (21ER/100.2IP), eight walks and 99 strikeouts in 19 games (14 starts) across three levels in the Astros system (Double A, Class A Advanced Class A)...led all of minor league baseball in strikeout to walk ratio (12.38), which was also the highest mark by a minor league pitcher since at least 2006...was named an MiLB.com Organization All-Star...posted the fourth-best ERA among all minor league pitchers...began the season at Class A Quad Cities where he went 4-1 with a 0.70 ERA (2ER/25.2IP) in ﬁve games (3 starts), striking out 23 and walking one...was named the River Bandits April Pitcher of the Month after posting the ﬁfth-lowest April ERA in the Midwest League (0.87)...was promoted to Class A Advanced Lancaster on May 9, and ended up going 4-0 with a 2.40 ERA (8ER/30IP), one walk and 43 strikeouts in six games (4 starts) at the level...was tabbed the JetHawks Pitcher of the Month for May after going 3-0 with a 3.00 ERA (8ER/24IP) during the month...ﬁnished the season at Double A Corpus Christi, going 4-0 with a 2.20 ERA (11ER/45IP), six walks and 33 strikeouts in eight games (7 starts) with the Hooks. July 10, 2018 Pittsburgh Pirates activated RHP Joe Musgrove from the 10-day injured list. July 3, 2018 Pittsburgh Pirates placed RHP Joe Musgrove on the 10-day disabled list retroactive to June 30, 2018. Right index finger infection. May 25, 2018 Pittsburgh Pirates activated RHP Joe Musgrove from the 10-day disabled list. May 12, 2018 Pittsburgh Pirates sent RHP Joe Musgrove on a rehab assignment to Indianapolis Indians. May 6, 2018 Pittsburgh Pirates sent RHP Joe Musgrove on a rehab assignment to Altoona Curve. May 1, 2018 Pittsburgh Pirates sent RHP Joe Musgrove on a rehab assignment to Bradenton Marauders. April 2, 2018 Pittsburgh Pirates placed RHP Joe Musgrove on the 10-day disabled list retroactive to March 30, 2018. Right shoulder strain. July 5, 2017 Houston Astros recalled RHP Joe Musgrove from Fresno Grizzlies. June 24, 2017 Houston Astros optioned RHP Joe Musgrove to Fresno Grizzlies. June 12, 2017 Joe Musgrove roster status changed by Houston Astros. May 30, 2017 Houston Astros placed RHP Joe Musgrove on the 10-day disabled list retroactive to May 27, 2017. Right shoulder discomfort. August 1, 2016 Houston Astros recalled RHP Joe Musgrove from Fresno Grizzlies. May 13, 2016 RHP Joe Musgrove assigned to Fresno Grizzlies from Corpus Christi Hooks. March 14, 2016 Houston Astros optioned RHP Joe Musgrove to Corpus Christi Hooks. March 14, 2016 Houston Astros reassigned RHP Joe Musgrove to the minor leagues. November 20, 2015 Houston Astros selected the contract of Joe Musgrove from Corpus Christi Hooks. September 27, 2015 Corpus Christi Hooks activated RHP Joe Musgrove from the 7-day disabled list. August 18, 2015 Corpus Christi Hooks placed RHP Joe Musgrove on the 7-day disabled list. July 20, 2015 Corpus Christi Hooks activated RHP Joe Musgrove from the 7-day disabled list. July 1, 2015 Corpus Christi Hooks placed RHP Joe Musgrove on the 7-day disabled list. June 9, 2015 RHP Joe Musgrove assigned to Corpus Christi Hooks from Lancaster JetHawks. May 9, 2015 RHP Joe Musgrove assigned to Lancaster JetHawks from Quad Cities River Bandits. May 4, 2015 Quad Cities River Bandits placed RHP Joe Musgrove on the temporarily inactive list. April 1, 2015 RHP Joe Musgrove assigned to Quad Cities River Bandits from Tri-City ValleyCats. June 13, 2014 RHP Joe Musgrove assigned to Tri-City ValleyCats from Greeneville Astros. August 29, 2013 RHP Joe Musgrove assigned to Greeneville Astros from GCL Astros. July 3, 2013 Joe Musgrove roster status changed by GCL Astros. June 20, 2013 RHP Joe Musgrove assigned to GCL Astros from Greeneville Astros. July 20, 2012 Houston Astros Traded RHP Brandon Lyon, LHP J.A. Happ and RHP David Carpenter to Toronto Blue Jays; Toronto Blue Jays Traded RHP Francisco Cordero and LF Ben Francisco to Houston Astros; Bluefield Blue Jays Traded RHP Joe Musgrove to Greeneville Astros; Dunedin Blue Jays Traded RHP Asher Wojciechowski to Corpus Christi Hooks; Lansing Lugnuts Traded LHP David Rollins to Lexington Legends and Lansing Lugnuts Traded C Carlos Perez to Lancaster JetHawks. August 27, 2011 Joe Musgrove assigned to Bluefield Blue Jays from GCL Blue Jays. June 23, 2011 Joe Musgrove assigned to GCL Blue Jays. June 22, 2011 Toronto Blue Jays signed RHP Joe Musgrove.